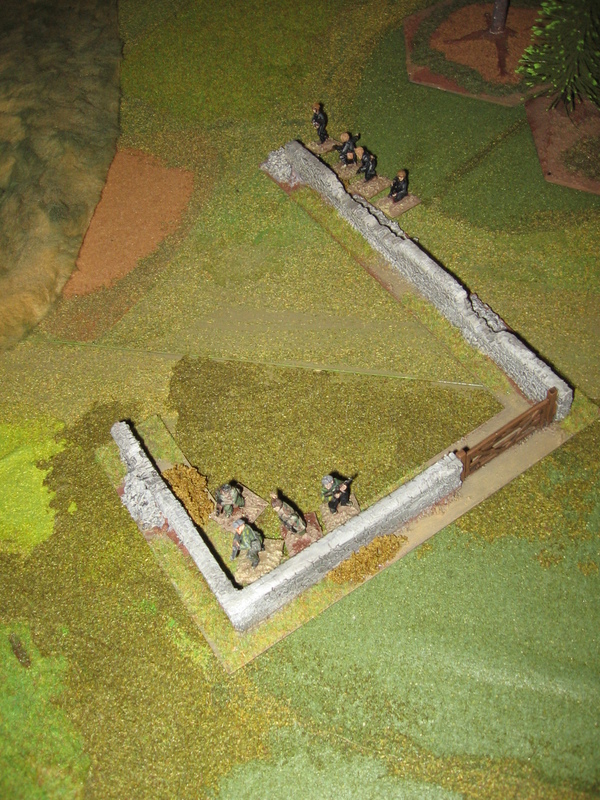 A while back the ModernAfricanBushwars yahoo group ran a quick competition- first to answer three questions correctly wins 50 Euros at Hobby Den model store. I saw the email whilst sat in my favourite cafe in town, fortunately the questions were on the Rhodesian War (the conflict in Africa I know most about) so I rattle off my answers and luckily little old me won. Deciding what to get was a nice experience and today I picked up my parcel from the Post Office. 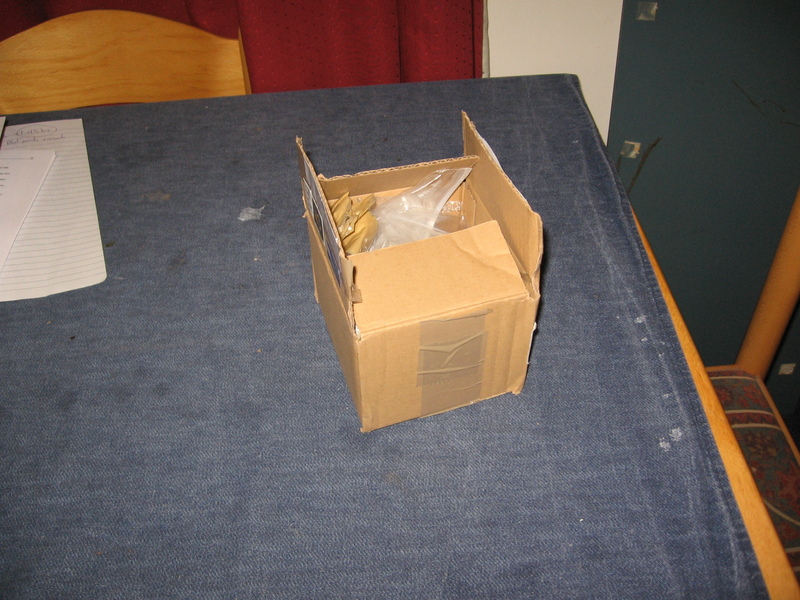 … and tip the contents out. 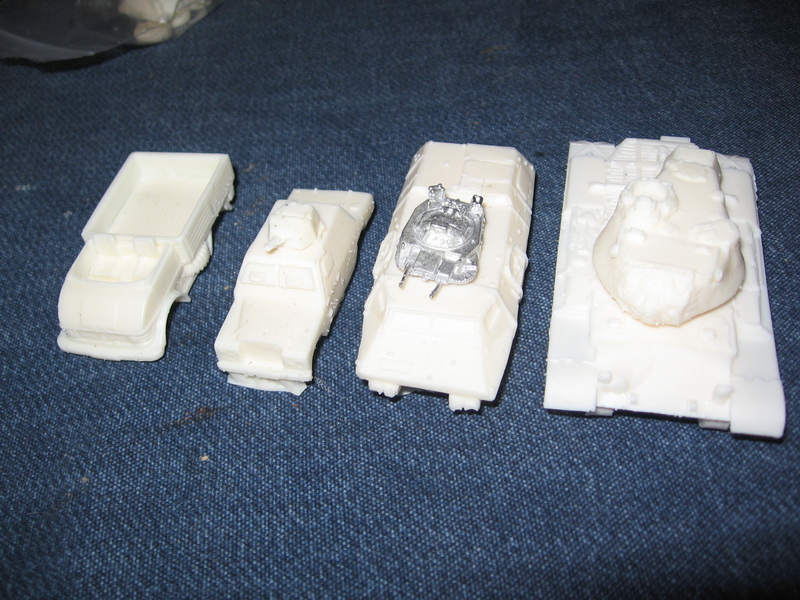 I got 3 open backed Unimogs, a M1117 armoured car, a Shorland armoured car and an M47 Patton. 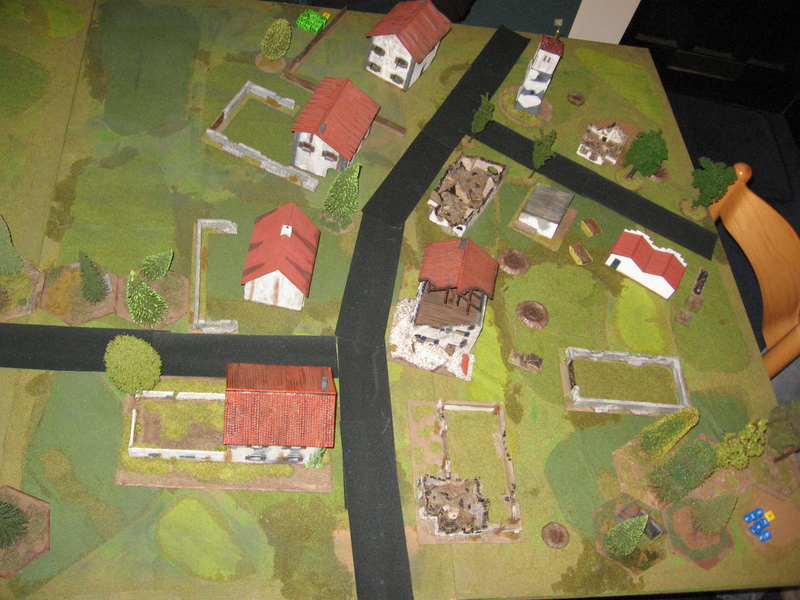 All of these models were from Hobby Den’s in house range of resins. 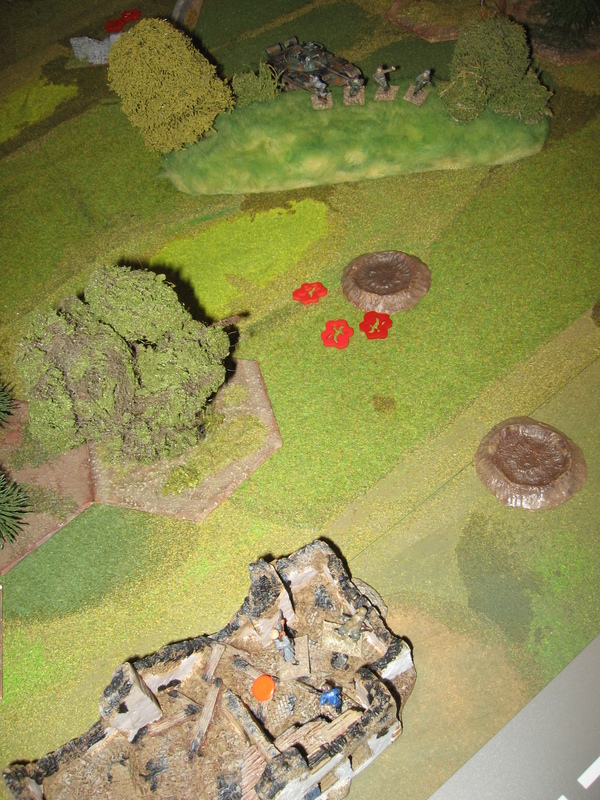 A quick shot of the hulls and turrets, photographing pale resin never really brings out the best in the models (well not with my barely functioning level of skill in photography). Hobby Den’s own range of resins are very nice and they do fill some useful gaps in the market- they come highly recommended from me. On the topic of URLs the yahoo group can be found here: https://groups.yahoo.com/neo/groups/ModernAfricanBushwars/info – worth joining for access to the photo albums alone. 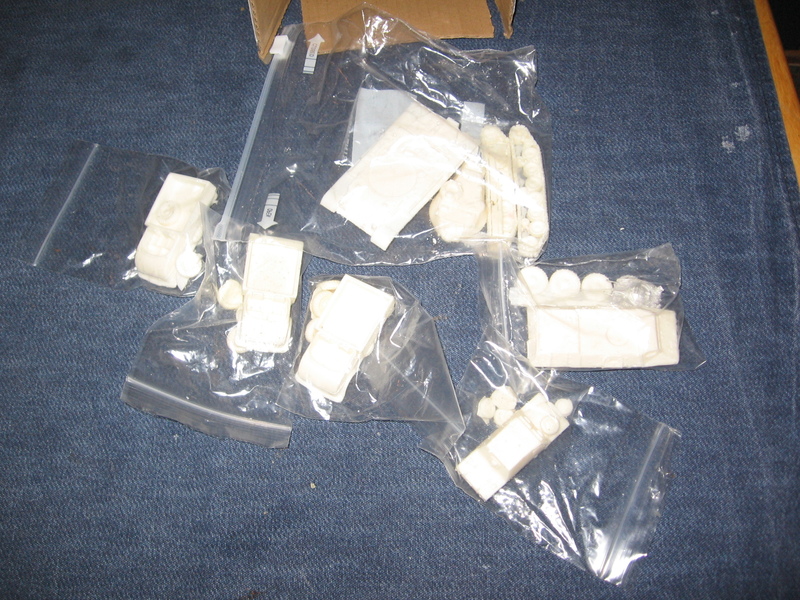 You might be wondering what I plan to do with my new resins..? 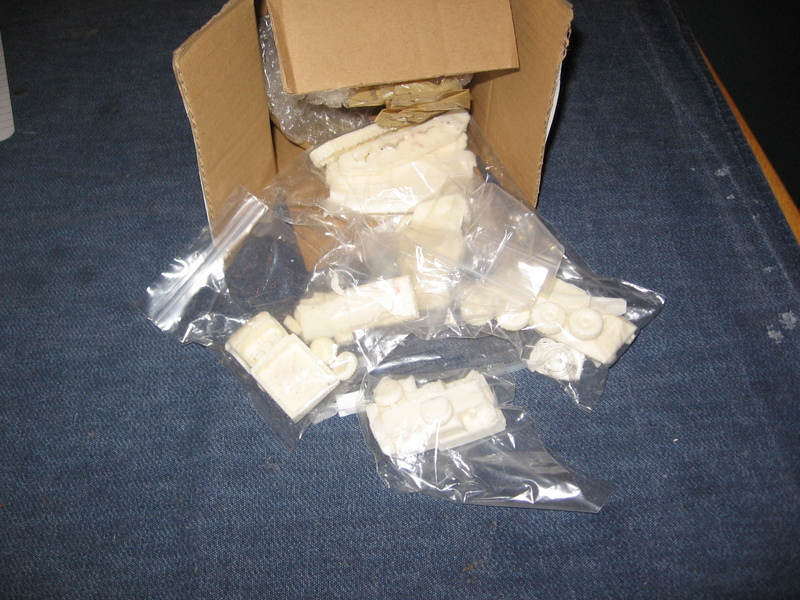 Well, the 3 Unimogs will be painted up to be added to my Rhodesian Bush War collection- though I’ll need to find some crew for them, the M1117 will be a sand colour for service in Iraq ( they were mostly used by the Military Police for convoy protection duties and I have been planning a game along those lines for ages), the M47 will be painted in Croat colours as I’ve got a decal sheet with a nice scheme on that I want to replicated and as for the Shorland I’m not so sure, I’m a big fan of them as they are basically armoured Landrovers with a turret on, I may do it in a Syrian camo scheme or possible a plain grey. Typing that last paragraph made me realize I’ve a complete lack of focus as I’ve covered 4 different projects there. If I could concentrate on one thing at once I’d probably get a lot more done but where would the fun be in that. 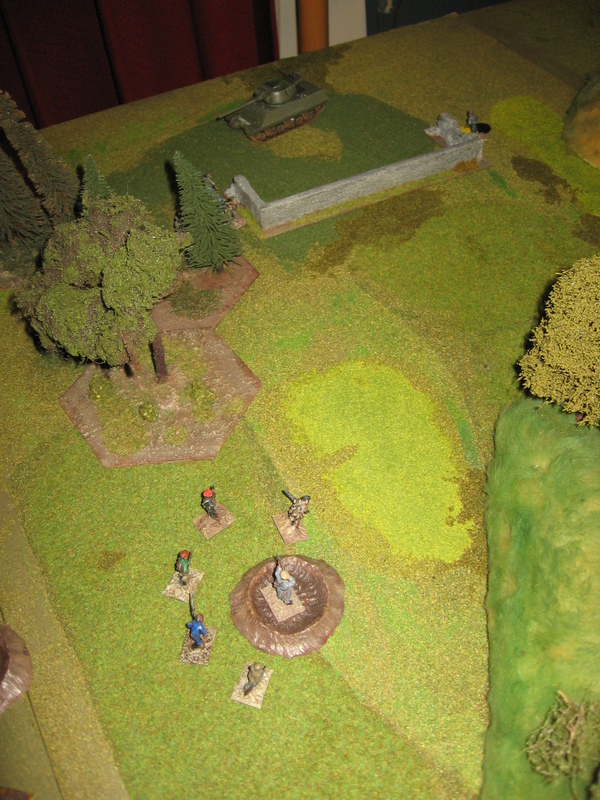 Nighttime Skirmish in the FYR. 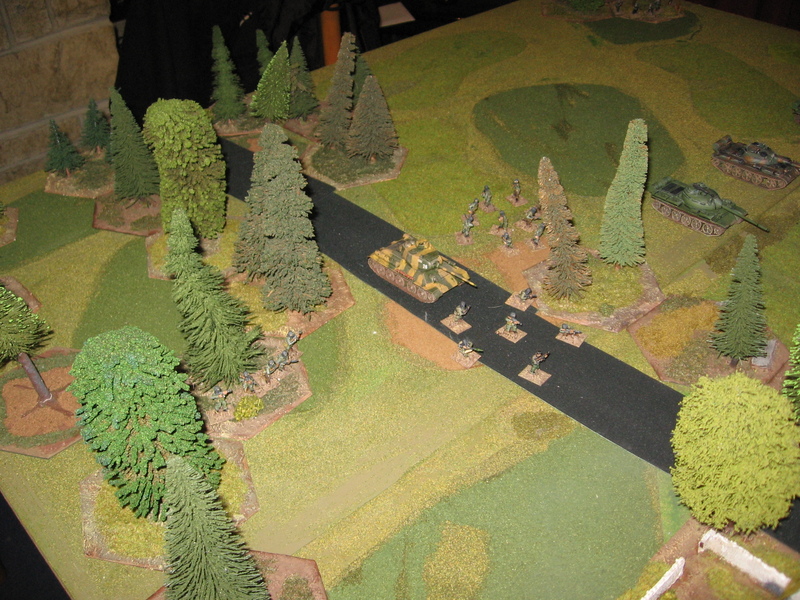 A Game AAR. 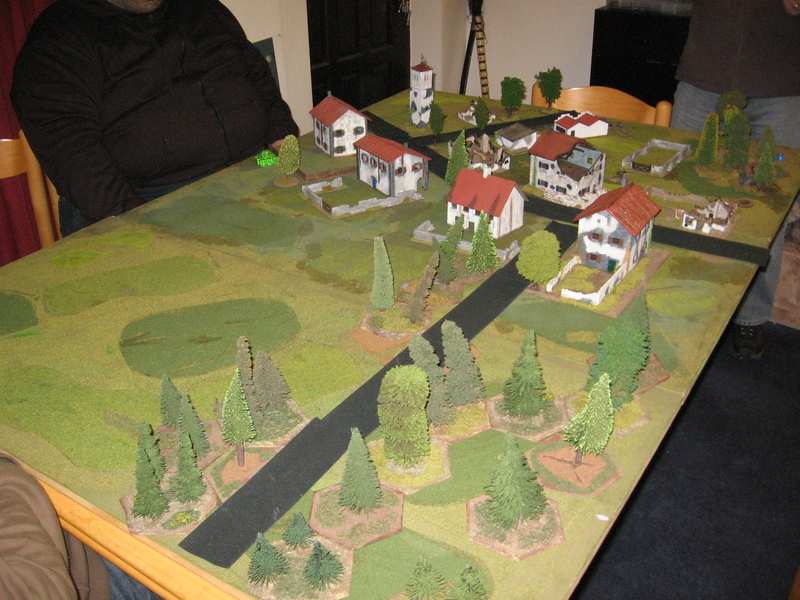 A couple of Tuesdays ago Evan and I sat down to play another 2HW skirmish game. As part of my continuing testing of the modern modifications I came up with a suitable scenario. 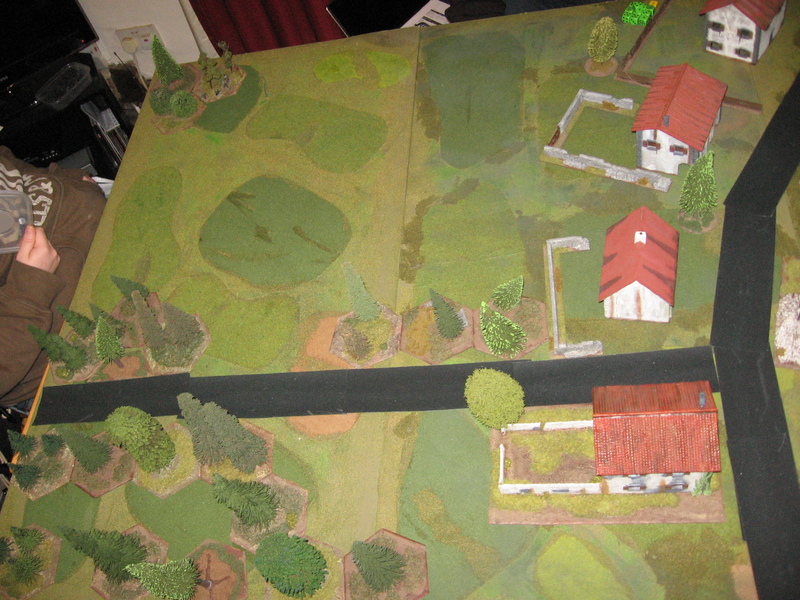 I took my inspiration from an old copy of SOTCW’s Journal and wrote a quick game set in the Yugoslavian Civil War. 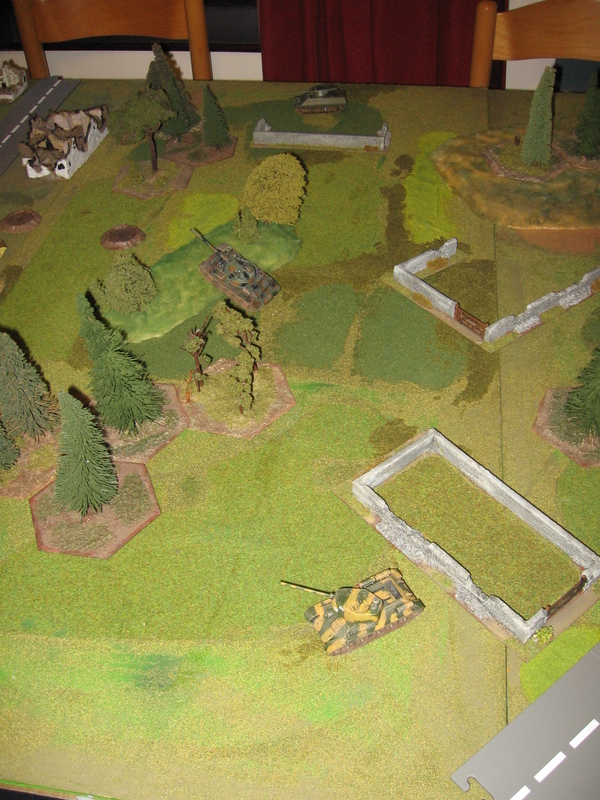 Rather than a game about Tanks in turned out to be a game with tanks in…. A few months after the Croat people declared independence from Yugoslavia, the Yugoslavian Army, JNA, surrounded the town of Vukovar. 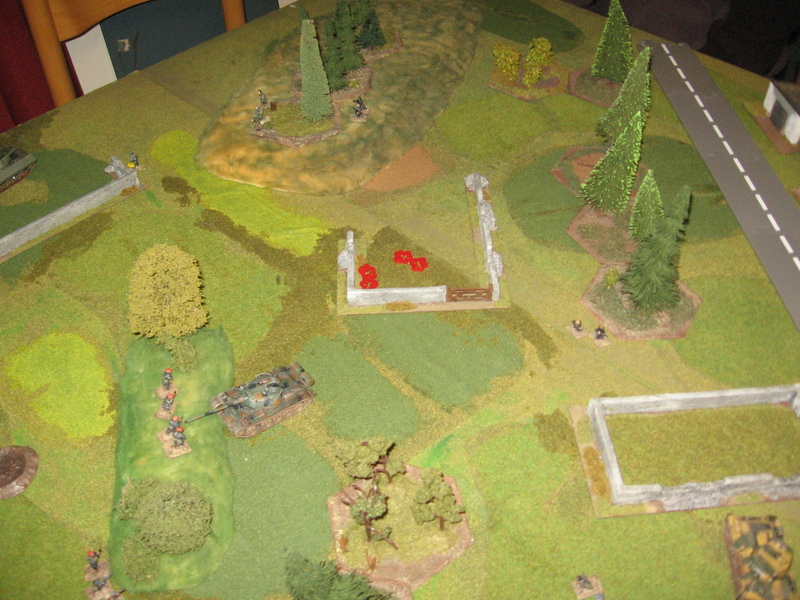 The siege last a bit over two months and saw some very heavy fighting. 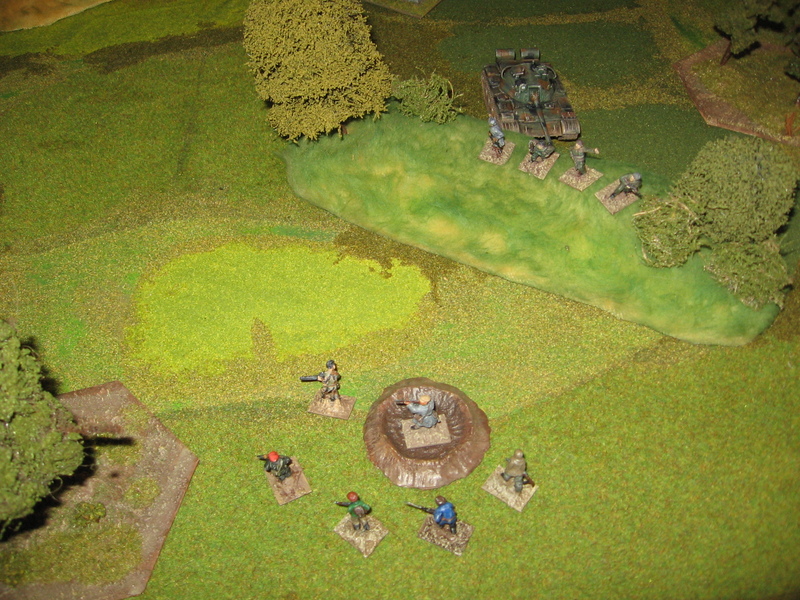 The general background to the game was as follows: The Serb offensive had been halting in the day’s fighting, leaving three tanks stuck in on man’s land, one is a ‘runner’ so both sides send out a small force to investigate after darkness falls; the JNA had 3 small squads and a tank crew to drive back the ‘runner’, the Croats had a mixed bag of right wing paramilitaries and militia trying to stop them. 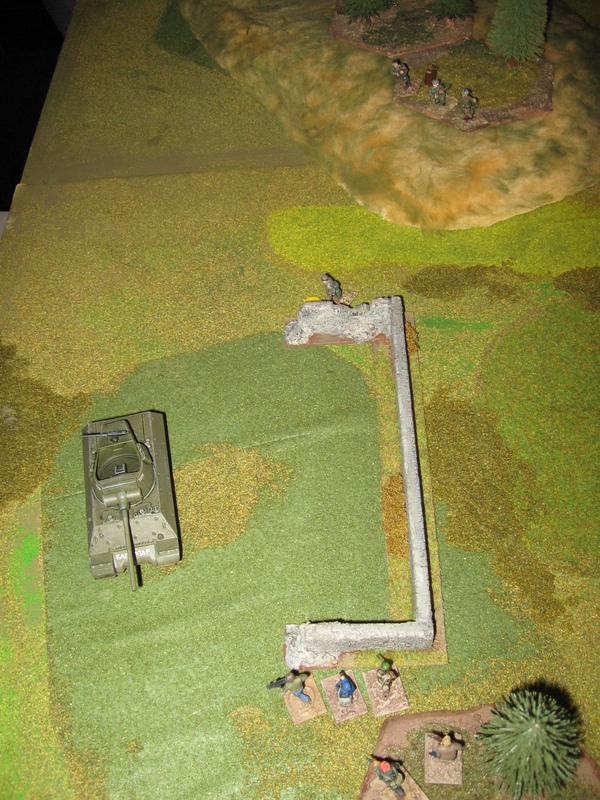 The table was out usual 6 foot by 4 foot, three tanks were put roughly in the middle of the board, a T55, a T34/85 and an M36 Jackson (not technically a tank but hey…). I took 3 white counters from my game bits box and put a little sticker under one of them. 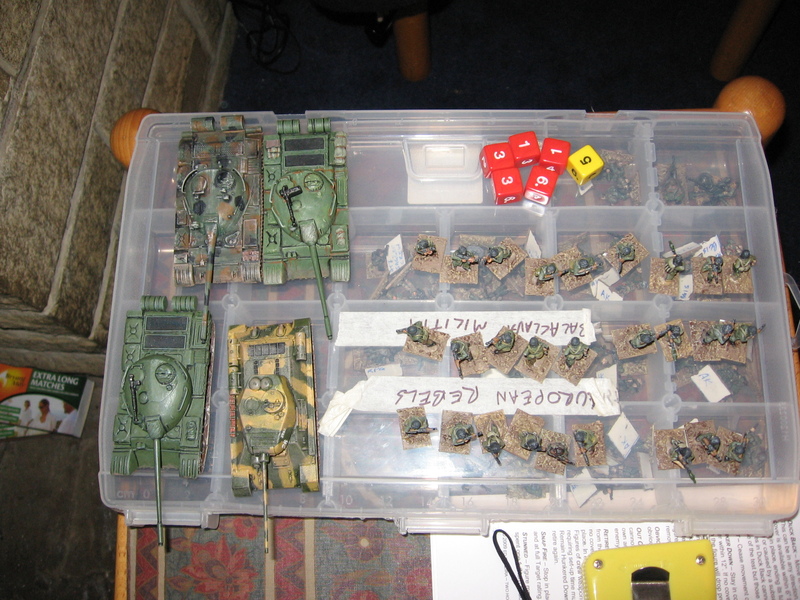 These were then mixed up and one placed under each tank. 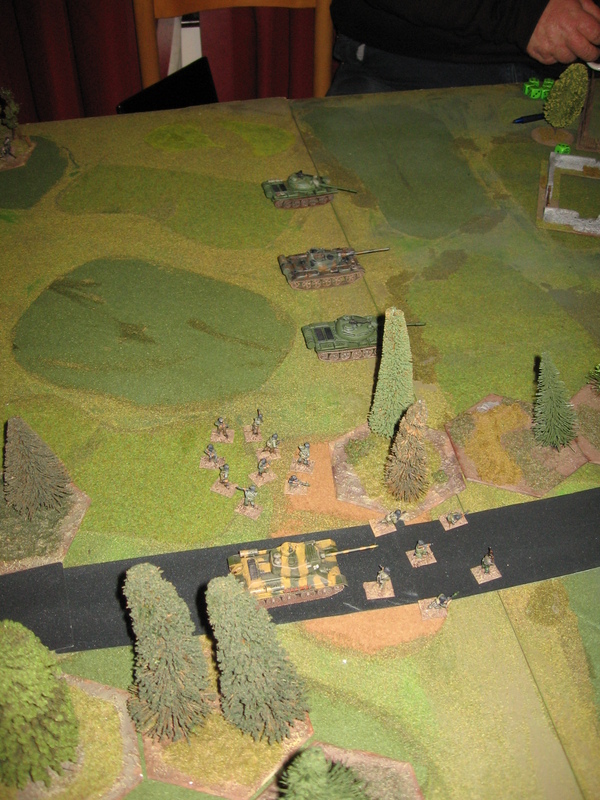 The idea was when one of our figures reached at tank we could examine the counter to see if that tank was the runner with out letting the other player know (the quality if one’s Poker face notwithstanding). 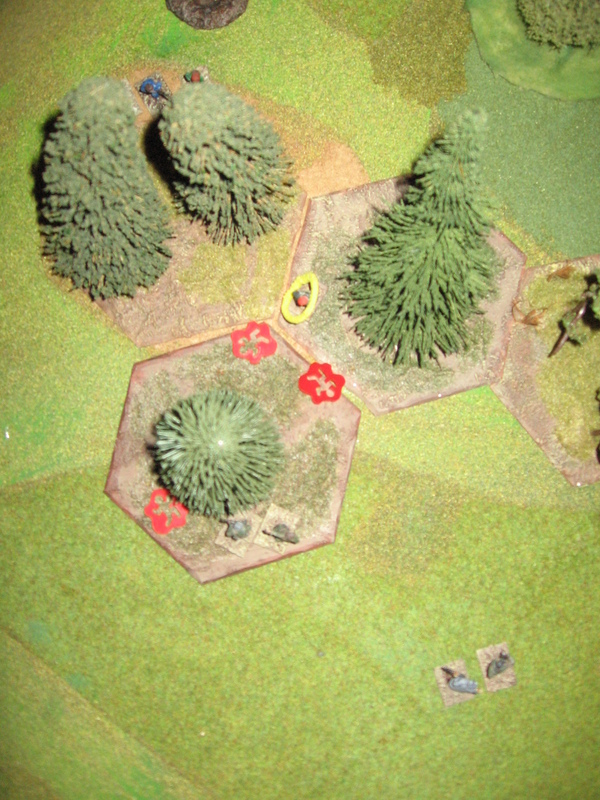 As usual rules were a hybrid of CR3.0, NUTS! 2nd ed. and my own modifications. 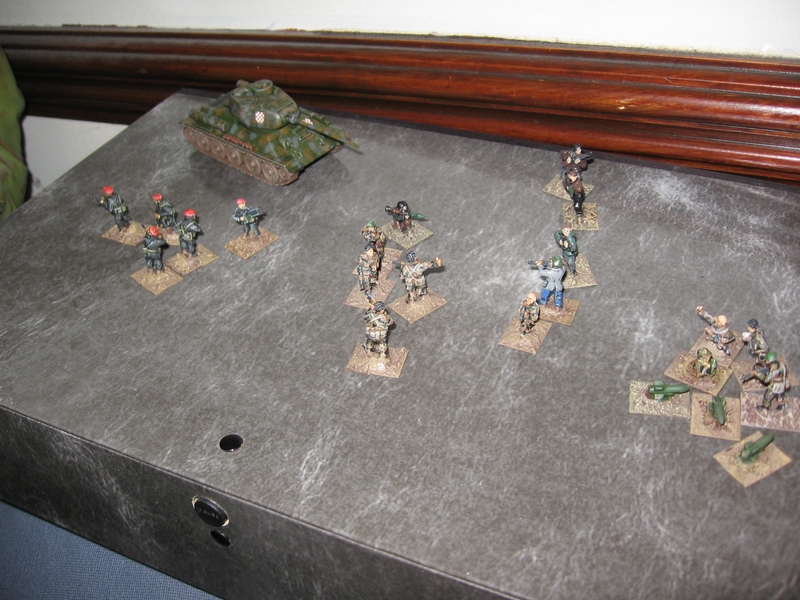 The table, looking from the JNA side to the Croat edge. 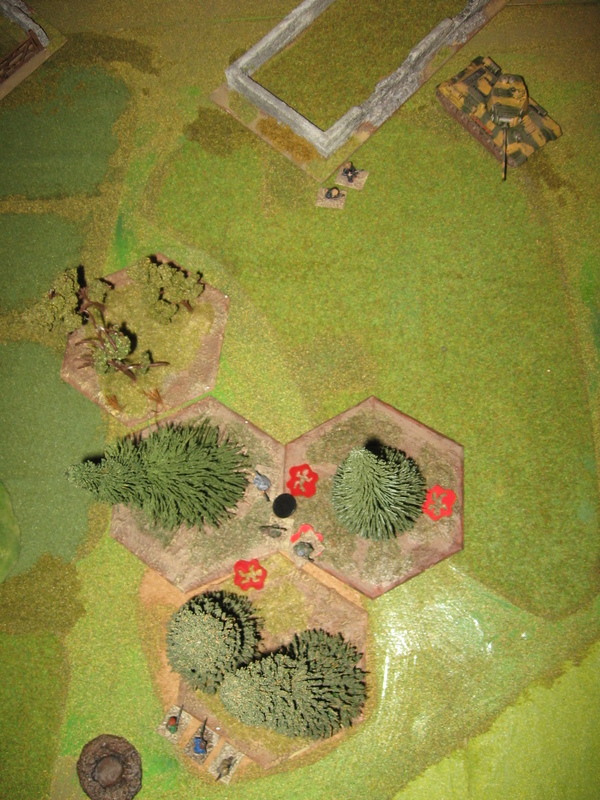 The three objectives for the game- only one of which is a ‘runner’. 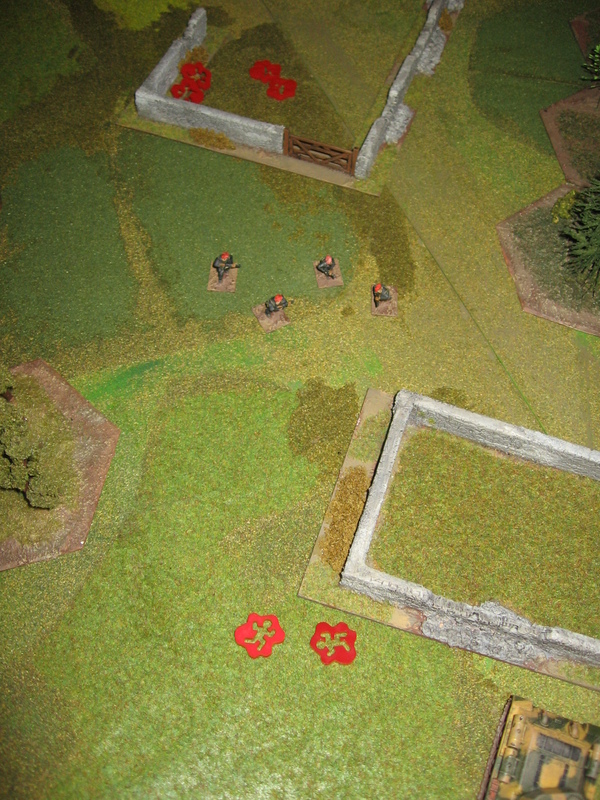 My mixed bag Croat forces advance in the centre, Evan and I had the same idea a squad to each tank and one held back in reserve. 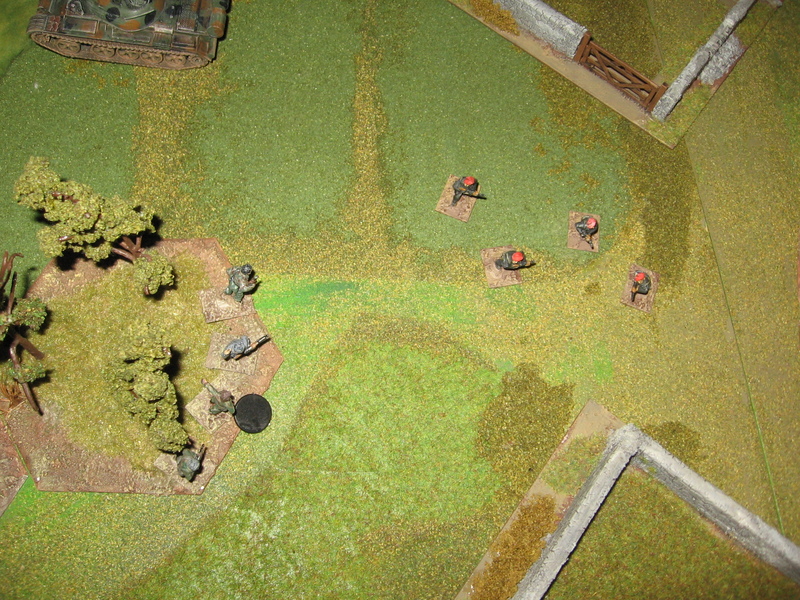 Croats moving on the left flank. 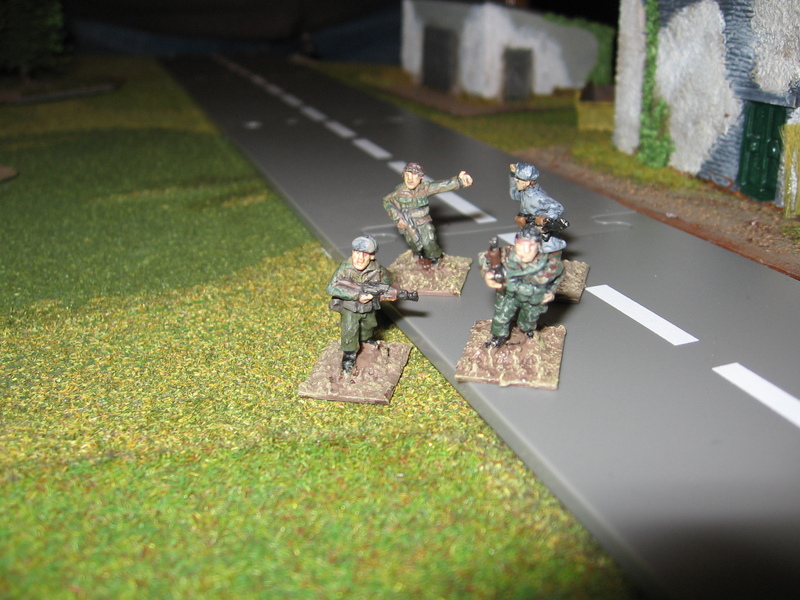 One of the JNA squads. 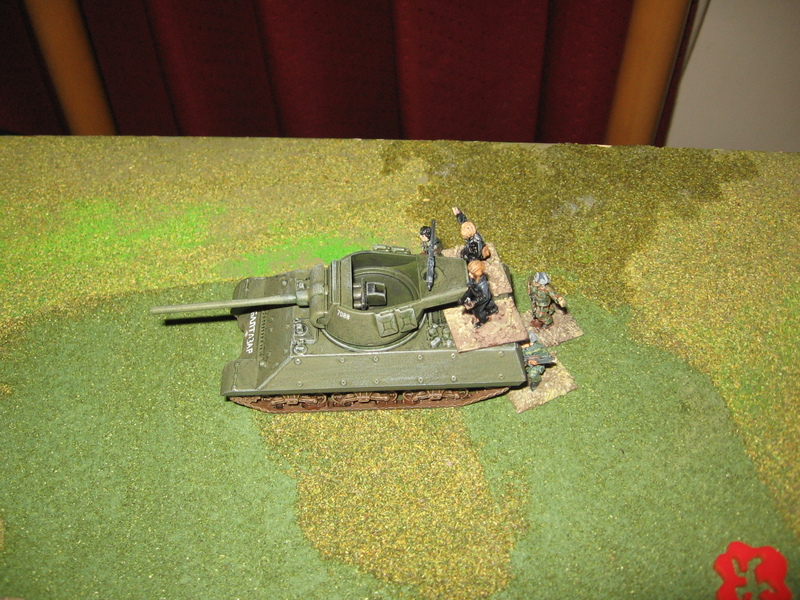 Another JNA squad and the tank crew. 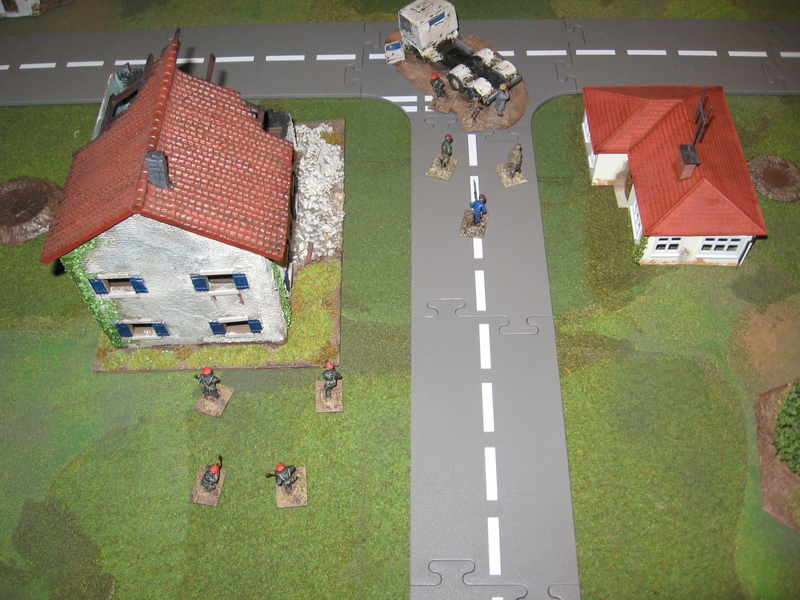 My Croats hold at the garage while another squads pushed on ahead. 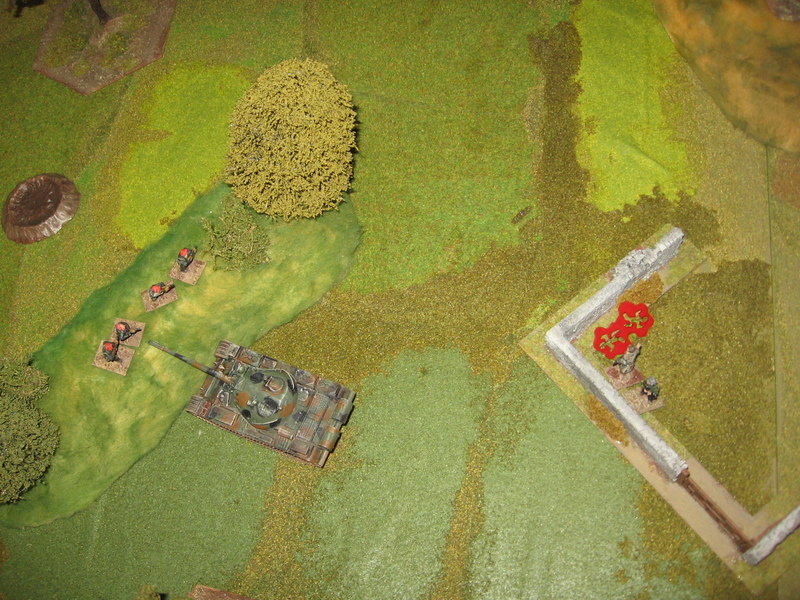 One of Evan’s squads reaches the T34/85 and checks its status. 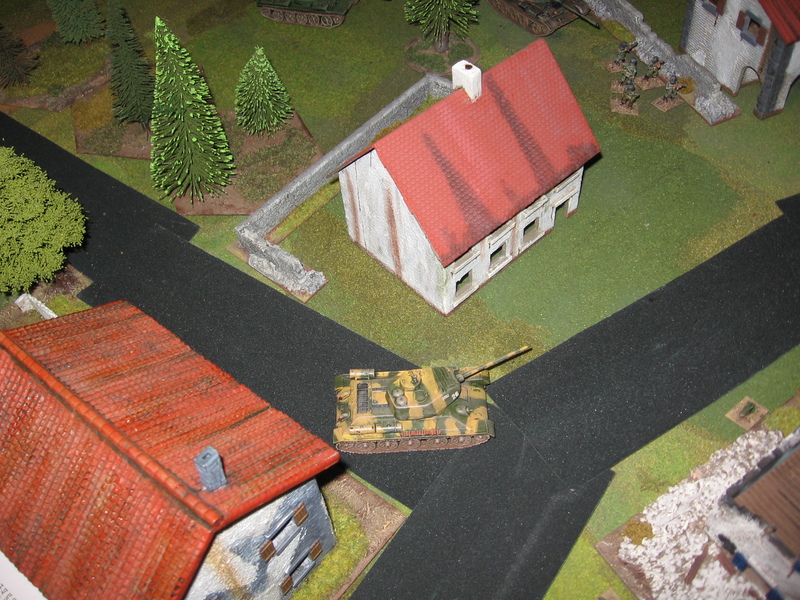 My paramilitary team reaches the crest just in front of the T55. Just able to make out figures in the gloom the fire on the JNA. 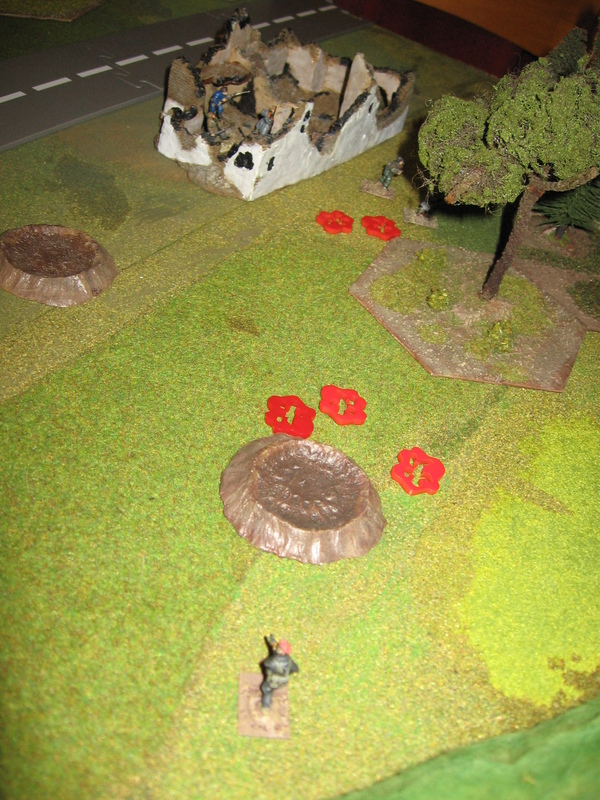 The red markers indicated killed and Out of Fight figures. 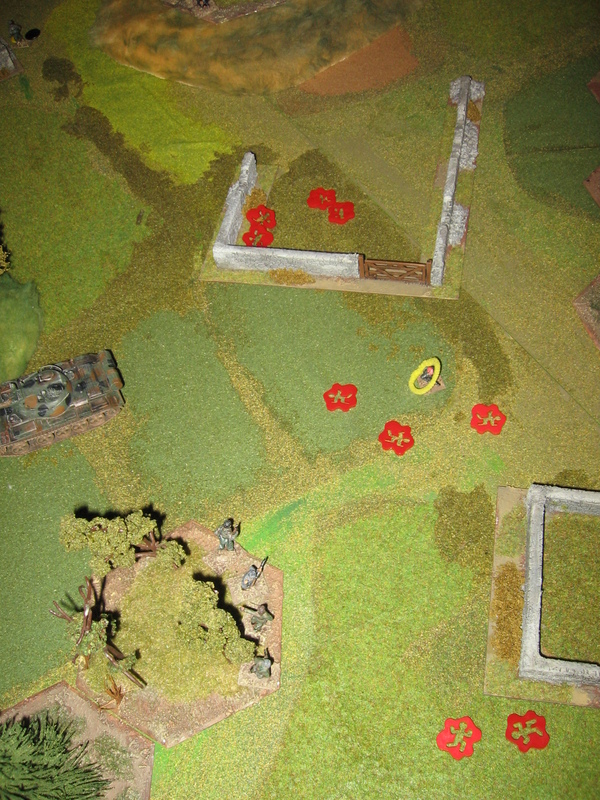 On my right flank I try to move on the T34/85 but suffer as a result. 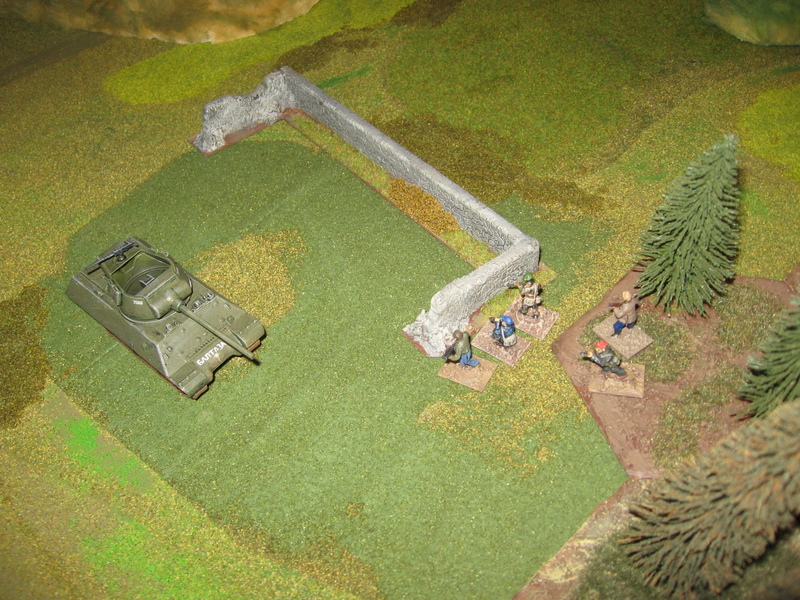 The Croat militia stop at the way to cover the line of approach to the M36. 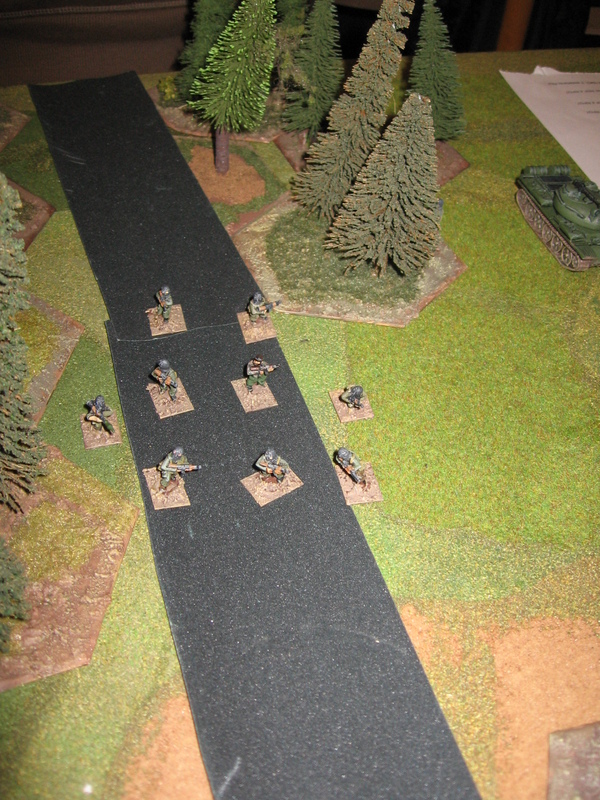 Evan’s squad moves up to try to get to the M36, unable to close due to my fire a ‘Mexican Stand off’ ensues. 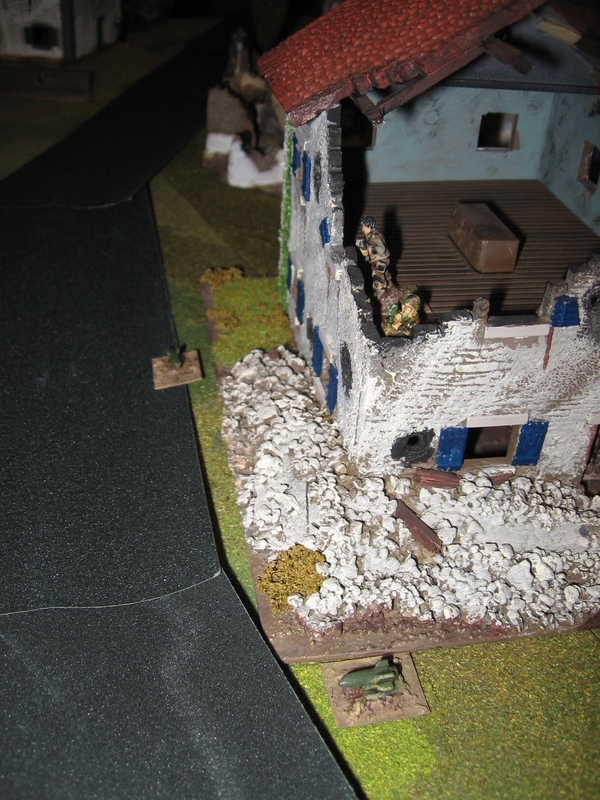 The Croat squad trying to get to the T34/85 suffers several casualties from JNA AKs and grenades. 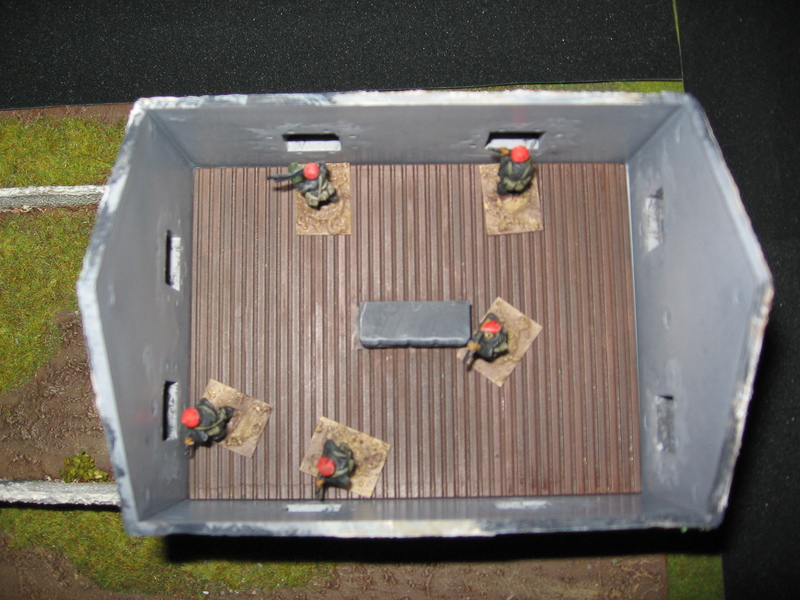 With my paramilitaries controlling the T55 Evan decided to split his tank crew into two pairs and send them one pair to each tank on the flanks. 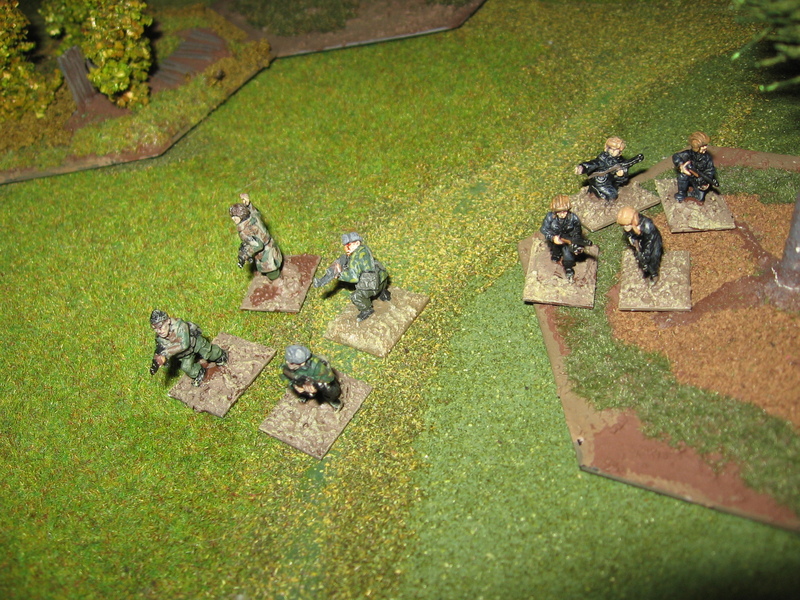 Having finished off the inital squad, the JNA move onto the lower quality militia. 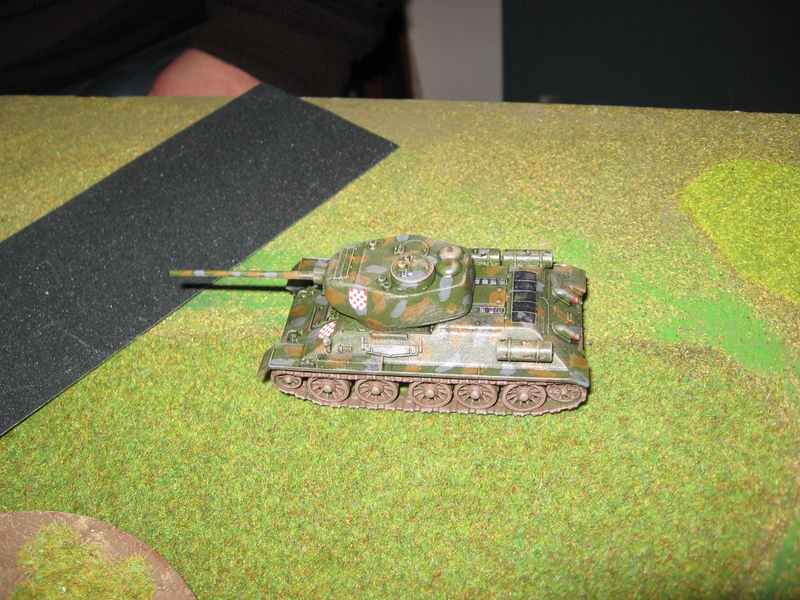 With my opponents attention else where I move my team down from covering the T55 (it wasn’t a runner anyway) and finish off one team of JNA and a pair of Tank crew. 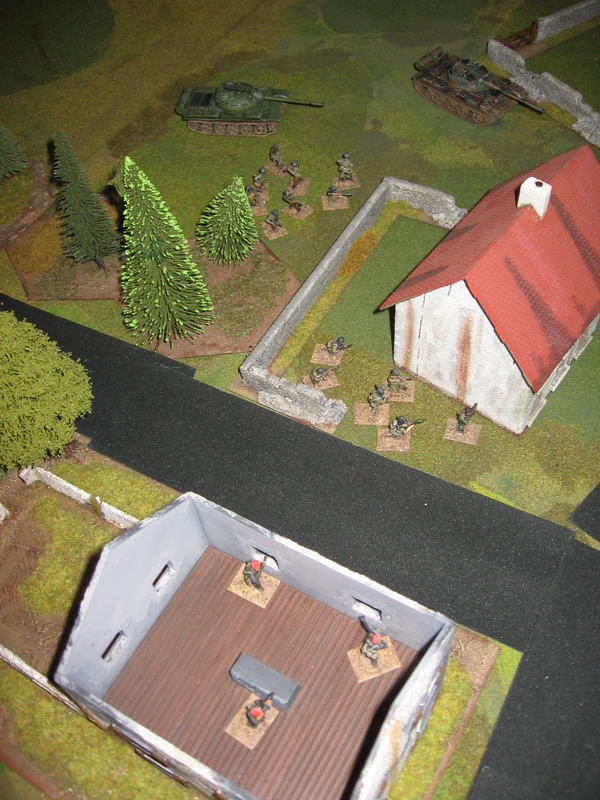 Hearing the gunfire Evan doubles back with the JNA and opens up on my exposed Croats. The result was predictable really. 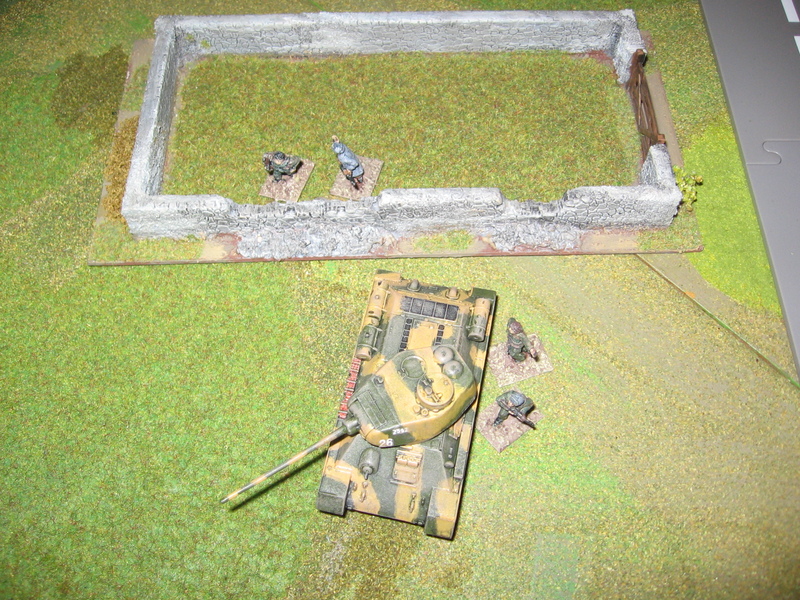 Knowing that the T55 wasn’t a ‘runner’ and guessing (correctly) that the T34/85 wasn’t either I moved my m,ilitia squad over to the M36, with an MG42 they had the most powerful weapon on the table. Evan wasn’t keen on my doing this so moved across to the ridge to try and stop me. 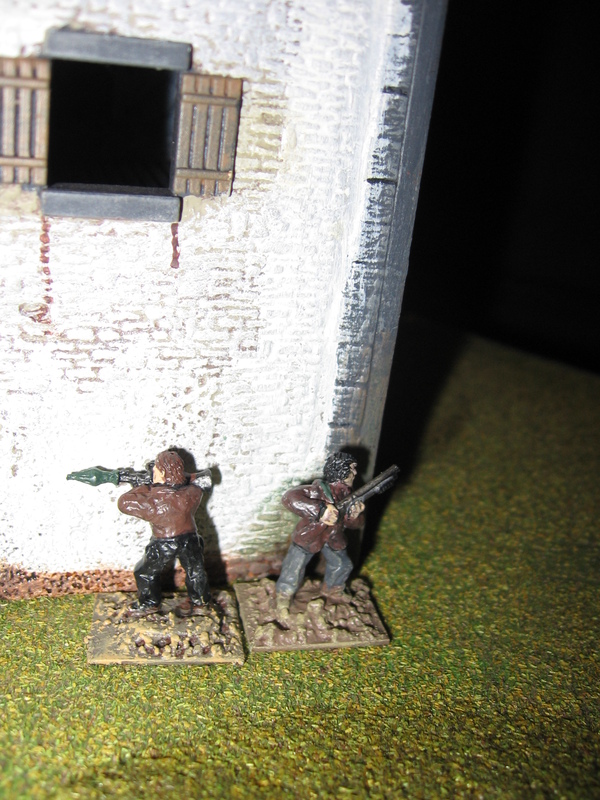 Which he did, the two surviving figures retired back to the relative safety of the ruin. 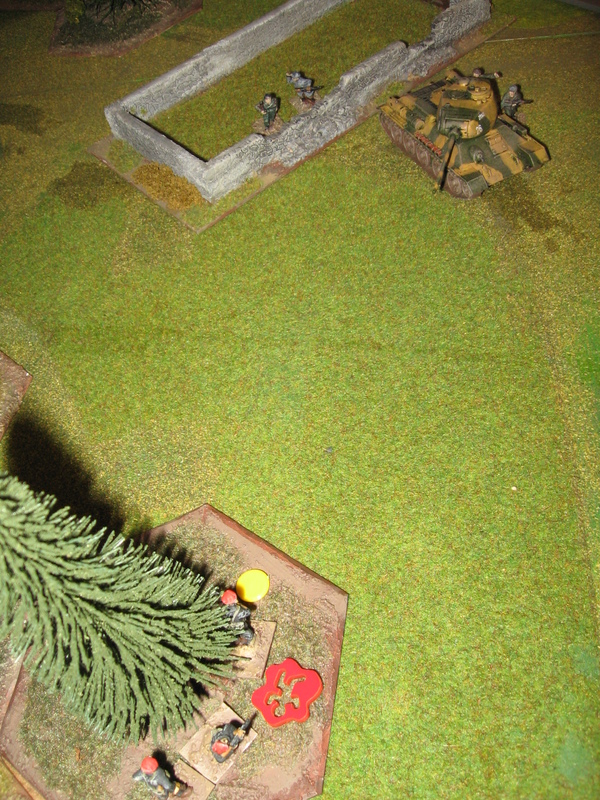 However my losses were avenged by the surviving paramilitary NCO. 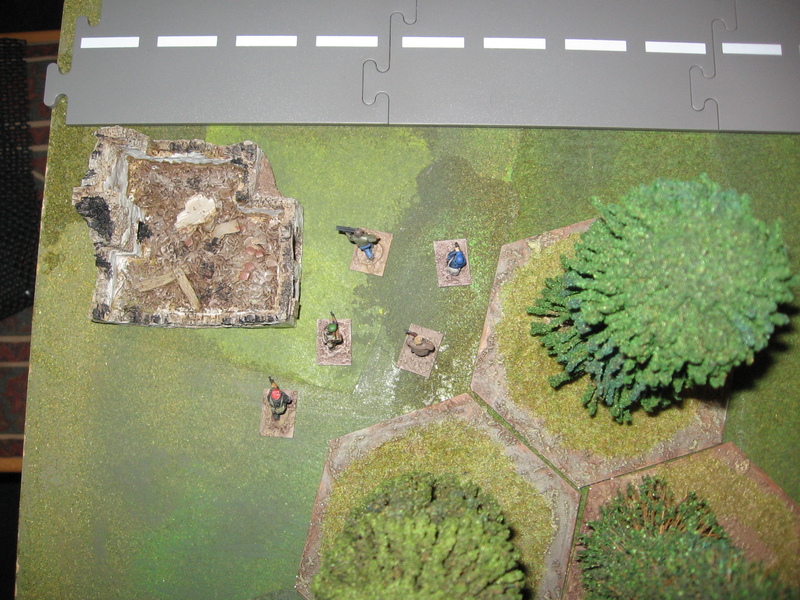 The backwards and forwards nature of the combat in the midle of the board had split my forces allowing Evan’s better trained troops to reach the functional M36 and crew it. 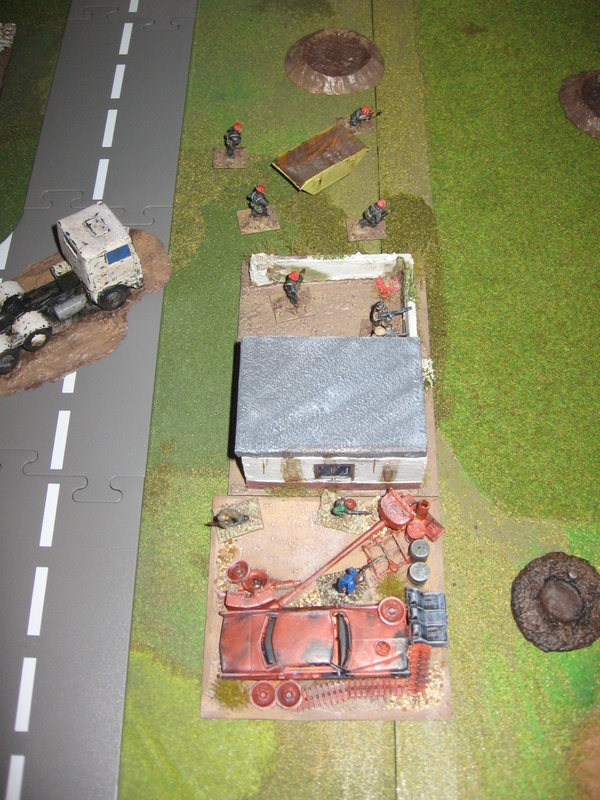 Here the game was finished as I had lost all of my Anti Tank capabilities. 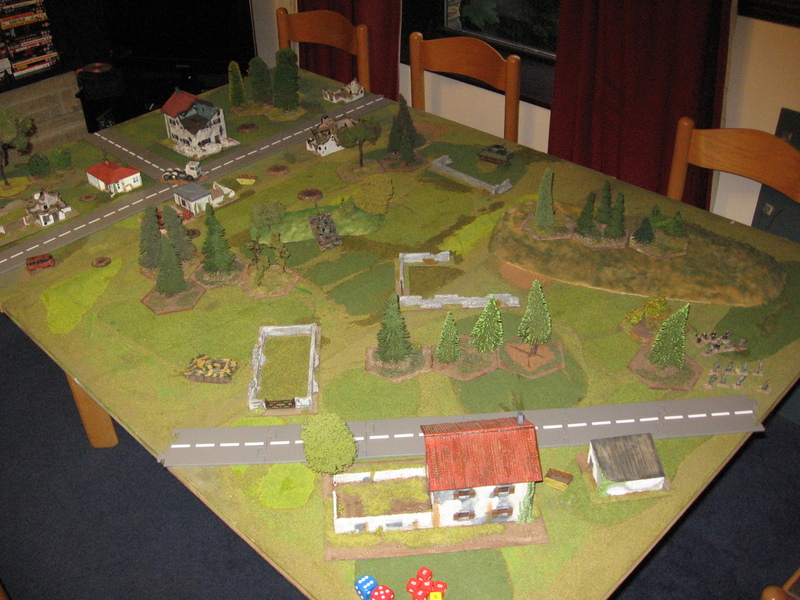 The table at the end of a hard fought game. 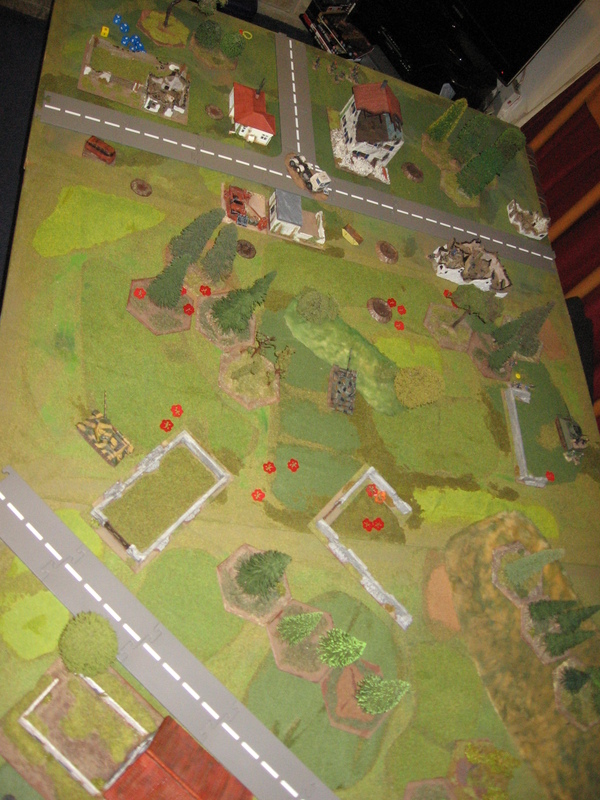 Both Evan and I thoroughly enjoyed the game, the action swung back and forth all evening, with neither side prepared to hold back, in fact we both commented that we took far higher casualties (about 60-75% of each of our initial forces) that would ever be tolerated in real life or even in a wargame that forms part of an ongoing campaign. 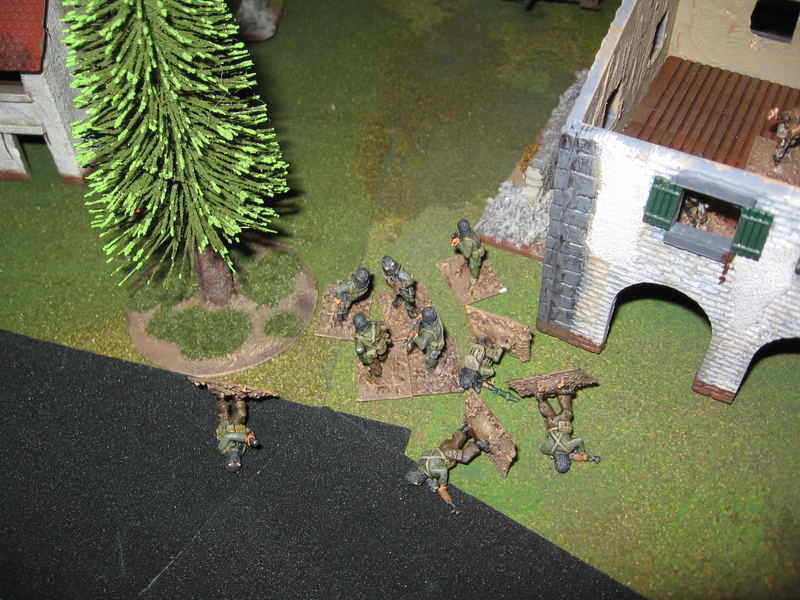 Playing at night added an extra level to the game, short range firefights were the order of the day and the long range dominance of light machine guns was completely negated.